The human mind is the source of all kinds of ideas that eventually reach the masses and spread throughout the world. The human will is a power that either draws people to itself, raises them up, sways and moves them toward a positive goal or, on the other hand, it can drag them down, bringing humanity, either happiness or misery. The human heart, burning with emotion, can be a powerful source of energy that warms, enkindles, ignites others — like steam or electricity — inspiring people to do good or it can be an evil and destructive force (Journal: Nov. 17, 1910). Shortly after his beatification, great things began to happen in Lithuania, his native land, under Soviet rule since 1940. In October of 1988 the Soviet government allowed the Lithuanians to display their own flag and use their own language. The cathedral in Vilnius, the capital city, has been returned to the faithful. This, the most important church in the country was confiscated during the Stalin era and turned into a picture gallery. Here Blessed George was installed as Bishop of Vilnius on December 8, 1918 — it was his church in a special way. Lithuanian Catholics were allowed to celebrate Christmas publicly for the first time in 1988. In 1989 Pope John Paul II will make his first visit to Lithuania, a request denied him in 1987 when he wanted to celebrate the 600th anniversary of Christianity in Lithuania and beatify Archbishop Matulaitis in Vilnius. George Matulaitis’ life spans two centuries—the end of the 19th and the beginning of the 20th — a period which molded our own era. He was born in 1871 in Lithuania, one of the three Baltic states whose struggle for autonomy has recently caught the attention of the world. At that time Lithuania was also part of the Russian Empire — a dark age without religious, cultural or political freedom. Little Jurgis (George) learned his native language at his mother’s knee, but at school he was taught in Russian. He was a country boy and life on his parents’ farm was good. However, sorrow dimmed his childhood — he lost both parents by the age of ten. His older sister Emily looked after him. In later life his heart always went out to children and especially to orphans. He would always stop to speak to a child. George Matulaitis- Matulewicz as a seminarian. At an early age he fell ill with tuberculosis of the bone, although it was diagnosed only much later. His illness interfered with his schooling and he had to drop out of high school. Walking on crutches, he helped out with the farm work. It was only through the kindness of an older cousin who was a teacher in Poland, that he was able to fulfill his secret dream — to enter the seminary. He completed his seminary studies in Poland and it was here that his last name was changed to Matulewicz. As an exemplary student he was sent to continue his studies at the Theological Academy in St. Petersburg (now Leningrad). Here he was ordained a priest in 1898 and received his Master’s degree in theology. Among the students he was known as a quiet, friendly and pious young man with a formidable intelligence. He was active in several student organizations and always willing to help his friends with their studies. He went on to Switzerland where he completed his doctorate in theology at the University of Fribourg in 1902. He was especially interested in apologetics, that branch of theology concerned with the defense of Catholic doctrine. His dissertation on Russian Orthodox theology showed a bent for ecumenical dialogue. He had also become proficient in languages — Polish, Russian, French and German. He was an expert Latinist as well. With such great intellectual gifts and a heart burning with enthusiasm to work in the Lord’s vineyard, it seemed that this young priest would do great things. Already he was filled with compassion for the persecuted Church in his own country and throughout the lands ruled by Russia. He could see how the Catholic Church was oppressed and hampered in every way: religious orders were expelled, closed down, persecuted; the hierarchy was pressured to conform with government demands and its control; the faithful were not allowed to worship in their own language and were penalized for engaging in the most harmless religious activities. When he recovered somewhat, he agreed to be chaplain at the girls’ school run by his benefactress, Cecilia Zyberg-Plater. He taught religion and was often brought to class supported by two people. Sometimes he would limp in on crutches. But even after many years the students remembered this young priest — his radiant personality and what he said to them, encouraging them to use their talents and their education for the good of others. From 1904 to 1907 Matulaitis himself became deeply involved in social action. Since his student days Matulaitis had been interested in social reform and in practical methods of improving the life of the working people according to the principles set down by Pope Leo XIII. At the University of Fribourg he had studied the leading Christian authors on social reform. In Russia and elsewhere he had seen the appaling conditions in which urban workers had to live and work. Something had to be done to help these people under Catholic auspices, otherwise they would be drawn toward atheistic socialism and revolution. Father George Matulaitis, along with a like-minded colleague, a Polish priest, Fr. Marcel Godlewski, organized a Catholic Workers’ Association in Warsaw. Several thousand workers joined and it proved to be very successful. Matulaitis cooperated with the Christian Democrats who were also concerned with the welfare of the urban workers. For a time he edited their paper, The Polish Worker. In Poland the movement attracted both positive and negative attention. It was considered to be very modern and many noblemen and landowners disapproved. However, enough of the clergy and laity were enthusiastic to keep Matulaitis busy giving talks and conducting seminars on social questions. Both in Poland and in Lithuania he was instrumental in organizing a series of lectures on social thought and social reform. Matulaitis was one of the key speakers presenting the teaching of the Church on property ownership and the rights of workers. In the fall of 1907 Matulaitis was invited to teach sociology at the Theological Academy of St. Petersburg. Not only the students, but also members of the faculty attended his lectures. A number of his listeners later became social reformers in their own countries. Matulaitis’ interests in social questions and social reform were never merely theoretical. He was moved by a deep compassion and real understanding of the plight of the worker. He knew first hand what it meant to be poor, dependent upon others, humiliated by a lack of the bare necessities. He knew too that pastoral ministry would not be effective unless it was also concerned with improving the living conditions of those who were being evangelized. Matulaitis appealed his fellow priests: “As living conditions change and the spiritual and cultural level of the people also changes, new problems and difficulties arise in the field of pastoral ministry; new tasks confront us. During the same period that he was involved in social action, Matulaitis was also acting as spiritual director and advisor for various underground religious communities for women founded by Father Honoratus, his own mentor. Father George revised their Constitutions, consulted with their superiors, gave conferences and helped individuals through the confessional. Matulaitis began to realize how much the Church needed new religious communities in order to survive oppression by hostile governments and the crisis of faith brought on by new philosophies and movements. In 1909 while he was still professor at the Theological Academy, 38 years old and with a promising career ahead of him, Matulaitis made a momentous decision. He decided to become a religious, to follow more closely in the footsteps of Christ. Having received permission from Rome, he made the three vows of poverty, chastity and obedience in a private chapel in Warsaw. At the same time, his close friend and fellow professor, Francis Būčys, was received into the novitiate. This was the beginning of the revival of the Marian Congregation. Closed down by the Russian government, it had only one surviving member. Matulaitis was convinced that God was leading him to resurrect this dying community and infuse it with new life. The Marian Fathers were well known to him — they worked in his parish church at Marijampole in Lithuania. He had been baptized by one of their generals. Now he resolved to revive and prepare them for an apostolate in the modern world. He gave up lecturing on sociology and taught dogmatic theology instead. He began to rewrite the Constitutions and at the same time directed his two novices. In the fall of 1910 he began to keep a journal in which he recorded his thoughts, inspirations and resolutions. His heart burned with a desire to expend himself for the kingdom of God — the Church. He and his fellow religious must take the risk — go out among the people, reach out to all to renew and strengthen their faith, then prepare them to evangelize in turn. With the rise of modern philosophies and movements, he could see that people were being influenced to abandon their faith. In his Journal he wrote: “Our concern is with all humanity and with the needs of the universal Church. We should be willing to hasten to any place where there is an opportunity to do something for the greater glory of God… In a special way we must direct our attention toward the vast territories of Russia and Siberia, where so many souls have strayed from the fold because there is no one to guide them; toward America with its noisy life-style where it is so easy for people to forget their spiritual needs” (Journal: Jan. 25, 1911). His idea was to build up a modern, mobile religious community dedicated to the apostolate. He was convinced that religious and laity must work together to bring the Gospel to every home. A life of intense prayer and work was the best way to achieve this: “Without continual prayer the soul wilts and withers; our energy burns out, our spirit is dissipated and our work becomes amazingly sterile. On the other hand, let us not forget that we worship and serve God not only when we pray, but also when we work for His glory” (Journal: Nov. 14, 1910). In 1911 Matulaitis was elected superior general of the Marians and remained in this position until his death. He was also novice master since they were so few. That same summer the novitiate was transferred to Fribourg, Switzerland, for St. Petersburg proved to be too dangerous: the Russian secret police had been conducting raids and searches for secret religious organizations. Under cover of the life of the University of Fribourg, Matulaitis hoped that the novitiate would be safer and grow more rapidly. In 1913 he and two young Lithuanian Marians travelled to the United States to start a mission in Chicago. In 1915, unable to leave Poland because of the war, Matulaitis gathered the Polish Marians together at a monastery outside Warsaw. This was the beginning of the Polish province. During this period the Marians and several sisters cared for a number of war orphans. Matulaitis himself would often go into German-occupied Warsaw to beg for provisions for the children. He would often return in the evening sitting on a wagonload of coal or potatoes. Fr. George Matulaitis-Matulewicz at Bielany near Warsaw, Poland, ca 1917. A number of interesting stories circulated in the area about the young priest and professor who was not afraid of the Germans. Once he went to a German official to ask for cots for the children. Serving the poor was a priority in all the religious communities that Matulaitis founded. In the spring of 1918 he went to Lithuania to restore the Marian monastery in Marijampole and to start a novitiate. In the fall of that same year he founded a Lithuanian community for women, the Sisters of the Immaculate Conception, popularly known as the Sisters of the Poor. Several years later he founded another religious community for women in Belorussia, the Servants of Jesus in the Holy Eucharist. All these communities are still active. Matulaitis updated the Constitutions of a number of religious communities according to the new Code of Canon Law — about ten in all. He was often asked for help and advice in spiritual matters and on concrete problems of how to adjust to the demands of modern life. 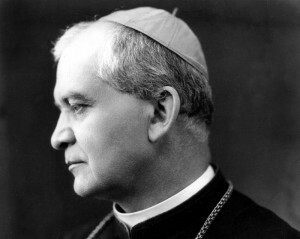 He not only prepared these religious communities for a more effective apostolate during the postwar period, but also for an even greater challenge in the future. With the Soviet regime came a new wave of religious persecution and it was these communities that were able to adjust to the situation, to hold out and to continue their apostolate in the persecuted Church. They helped and encouraged the laity to remain firm in their faith and were a great help to the clergy. The religious resistance movements that developed in the east European countries gives evidence of the firm foundations that had quietly been laid down earlier. His vision of unity and harmony, however, proved extremely difficult to realize in those turbulent times. During his time as Bishop of Vilnius — 1918 to 1925 — Matulaitis had to walk along a thorny and treacherous path. He had to contend with six different civil governments — some of these were openly hostile to the Church and to its hierarchy. Political and national conflicts often blinded clergy and faithful alike to the demands of Christian charity. His large, ethnically mixed diocese was seething with unrest: the people were fearful, food was scarce and political passions ran high. Lithuanians, Belorussians and Poles were all striving for independence after the long and unhappy period of Russian rule since 1795. Within two weeks of assuming his duties, Bishop Matulaitis felt himself caught in a political crosscurrent. “My own position is extremely difficult,” he wrote; “whatever one faction approved of, another opposed. It was impossible to please them. The cauldron was boiling over. I kept to the teaching of Christ and of the Church.” (Journal: Dec. 16, 1918). He wanted all of his flock to live in peace and harmony and did his best to reconcile persons and nations. He would not allow the Jews to be persecuted and when public furor rose against them he would intercede for those who were arrested or plead that food be distributed fairly to all. The conflict between the Poles and the Lithuanians over the city of Vilnius was especially acute at this time. Bishop Matulaitis refused to take sides but urged both nations to negotiate peacefully: “Perhaps, when each takes a good look at the other, they will see that neither is the monster they had imagined,” he noted down in his Journal. However, his efforts were often disregarded and misinterpreted. He experienced great sorrow and inner anguish because of the way Christian people and nations were behaving toward each other: “My God, my God what a terrible thing is the politics of our time! Morality is completely excluded from the political arena. The same morality which governs and guides relations between individuals should also govern the relations between nations. Christ has not given us a double standard nor dual justice, but only one. There can be no peace between nations until they begin to base their relations with one another on the moral principles of Christ” (Journal: May 3, 1919). Today his words have a prophetic ring. Because of his refusal to take sides or to promote the interests of one political party or nation against another, Bishop Matulaitis was criticized, attacked and denigrated. Yet, he remained gracious and cordial even to those who publicly vented their antagonism or snubbed him personally. In some cases his goodness won them over. One of these was Bishop Wladislaw Bandurski who came to Vilnius with General Zeligowski’s army which occupied the city in 1920. Bandurski was official army chaplain and spokesman for Pilsudski and his supporters. At first he refused even to pay Bishop Matulaitis the required formal visit. Persuaded to do so by Chancellor Lucjan Chalecki, a fellow Pole, Bandurski came to pay his respects and ended up staying till midnight, so charmed was he by Matulaitis’ cordiality. Later on, when different political winds were blowing and Bandurski was in disfavor, his financial situation became difficult. Bishop Matulaitis noticed that his cassock was worn and frayed. He secretly ordered a new one made and delivered. Bandurski guessed who was responsible. He was deeply moved and when Matulaitis was celebrating the silver jubilee of his ordination in November of 1923, Bandurski agreed to give the sermon. In it, he warmly praised Bishop Matulaitis for his truly Christian spirit, his love for the Church and his fairness and regard for all entrusted to his care. In the summer of 1925 Matulaitis’ resignation from the diocese of Vilnius was accepted by Pope Pius XI, his personal friend and colleague. Poland had signed its Concordat with the Vatican and Vilnius was going to be made an archdiocese. Matulaitis was well aware that he had to withdraw. He quietly left Vilnius and went to Rome where he hoped to establish the Marian generalate and a house of studies. However, the pope made him titular Archbishop of Adulia and appointed him Apostolic Visitor to Lithuania. Archbishop George Matulaitis-Matulewicz in Cicero, U.S.A., June 13, 1926. Archbishop Matulaitis returned to his native land and settled in the Marian monastery in Kaunas. His first task was to prepare a project for the formation of an independent ecclesiastical province for Lithuania. When the project was approved by Rome, Lithuania was divided into five dioceses. Matulaitis officiated the consecration of the five new bishops in 1926. In June he sailed to the United States to attend the International Eucharistic Congress in Chicago. He also visited 92 Lithuanian parishes and gave over 200 homilies and speeches. Everywhere he was welcomed with great enthusiasm. The railway car in which he was traveling was even painted violet in his honor! Back home he began work on the Concordat between Lithuania and the Vatican. However, he did not live to see its completion. He died after an appendix operation in Kaunas on January 27, 1927 at the age of 56. Funeral solemnities were held in Kaunas for three days. The body was first placed in state at the Marian Church of St. Gertrude and then it was carried in solemn procession, presided over by Archbishop Karivicius, to the Kaunas cathedral. Transfer of the Archbishop George’s earthly remains from the Kaunas cathedral to the church in Marijampole, October 24, 1934. Throngs of people came to mourn him; all the church bells of Kaunas pealed a final farewell. Every national group recognized the enormity of their loss: he had been a father to all. Thousands attended the funeral. He was buried in the crypt of Kaunas cathedral, but the remains were transferred to his own parish church in Marijampole in 1934. On May 11, 1982, the Congregation for the Saints issued a decree stating that during his lifetime Archbishop George Matulewicz practiced virtues to a heroic degree. On June 28, 1987, the Holy Father, John Paul II solemnly beatified him at St. Peter’s Basilica in Rome. On the occasion of his beatification, a special repository was made for the remains and an altar constructed. This has now become a national shrine where Lithuanians and people from other countries come to pray. Blessed George Matulaitis was a man of peace and also blessed with a special love for the Church. At the end of his life it was evident that Blessed George lived in undisturbed peace. The last resolution recorded in his Journal was: “To pray more for those from whom I have experienced any kind of evil” (Journal: August, 1925). His favorite Scripture quotation had always been: Non in commotione Spiritus Dei — The Spirit of God cannot be felt in turmoil. Blessed George’s love for the Church was the great passion of his life — but it was a peaceful passion that stretched his heart and broadened his vision. One of his biographers, Msgr. Vincenzo Cusumano, said that he was a man in love with the Church. If I may ask, Lord, let me be but a kitchen rag in your Church, a rag used to wipe up messes and then thrown away into some dark and dirty corner. I want to be used up and worn out in the same way, so that your house would be a little cleaner and brighter. And afterwards, let me be thrown away like a dirty, worn out dishrag (Journal: Jan 13, 1911). His prayer was heard. All his natural and spiritual gifts were used by God for the growth of the Church in his own country and in other lands. He wanted to be like a candle that burns out on the altar — to be consumed by the fire of love and the heat of hard work for the glory of God. Today, the light of his life shines out for us all to see. We know that God is with us and with all who toil and suffer for His kingdom. That kingdom has not, nor will ever be overcome by the powers of darkness.